NEW GULF UAE JOBS – DUBAI (U.A.E) Leading European Civil Construction Company. Walk In Trade By Client In Mumbai At Gulf Trade Centre, Near Balaji Restaurant, Bandra (W), Mumbai – 400050. Candidates who are Searching for the NEW JOB VACANCIES IN UAE can check the details of Jobs in uae for engineers and TECHNICIANS. that have been recently posted in this site. Here we are Updating all the details of the Job Interview like Job Positions, No. Of vacancies, Salary details, date of the Interview Etc.., Interested and Eligible Candidates can Apply for the Walk In Interview. HUGE GULF UAE JOBS – STEEL FIXERS 100 vacancies are available, Electrician (Maintenance) 4 vacancies are available. Plumber (Maintenance) 4 vacancies are available. WALK In CLIENT INTERVIEW IN MUMBAI On 24th April (Monday) At: AM Overseas, A-115, Raikar Chambers, next to Jain Temple, Govandi (E), Mumbai-88. RIGGERS – 20 vacancies, MOBILE CRANE OPERATOR LIC -8 , 12 vacancies are available. WHEEL LOADER OPERATOR LIC-8, 12 vacancies are available. BACKHOW LOADER OPERATOR, LIc-8, 12 vacancies are available. DOzer Operator LIc-8 12 vacancies are available. Excavator Operator LIC-8, 25 vacancies are available. TELEHANDLER OPERATOR LIC-8, 10 – vacancies are available. CURRENT GULF UAE JOBS – DUMP TRUCK DRIVER LIC – 8, 50 vacancies are available, LIght Vehicle drivers LIC-3, 10 vacancies are available. SI. #3-9 must Hold valid UAE Driving License issued on or before 2015. Execellent SALARY + FREE FOOD + OT + ACCOMODATION. Candidate must have 3-5 Years of EXp (preferably Gulf). Apply with Complete CV, Original Passport, relevant Documents & 2 Photos with white Background to: A. M Oerseas MANPOWER CONSULTANT, A-115, RaikarChambers, Next to jain Temple, Govandi (E), Mumbai-88. Tel: 022 25555776 / 7 / 8. Interested and Eligible candidates can Send your resume to the Email Id: [email protected], Website:www.amoverseas.net. Urgently required for leading Construction Company – Sharjah. Candidates who are seeking for Jobs Can also check the details of latest GULF UAE Jobs in Sharjah for freshers which have been recently posted in this site. Here you have the complete details of recruitment like Job description, Experience required, Salary etc. 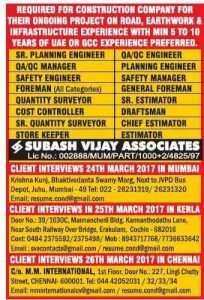 Candidates who are Eligible for applying to this Job vacancy Should have Minimum 3 Years Gulf Experience in Construction is Essential. The Postings are Piping Engineer, Structural Engineer, Structural Supervisor, Mechanical Engineer, Rigging Engineer, Jr. Engg./Tech Aadmin, Piping Superintendent, Mechanical Superintendent, Planners, Material Superintendent, Planners, Materials / Store Supervisor, HSE Advisor, QA / QC ( Inspector). Recently we have updated the latest Job Postings i.e Construction Jobs in Kuwait, latest Gulf Job Vacancies, KSA jobs and Some more Job Postings in this site. Can check this site For more latest Job Update details. EMAIL: [email protected] Bright 366/68 Kalbadevi Road, Mumbai 400002, International Diamond Mansion.